China's President Xi Jinping delivers his opening speech at the Boao Forum for Asia Annual Conference in Boao in south China's Hainan province on Tuesday. Xi promised to cut auto import taxes, open China's markets further and improve conditions for foreign companies in a speech Tuesday that called for international cooperation against a backdrop of a spiraling dispute with Washington over trade and technology. BEIJING — President Xi Jinping renewed a pledge Tuesday to open China’s markets further for trade and investment, including in its automobile sector, and said he would also work harder to boost imports, in what was seen as a conciliatory speech amid an escalating trade conflict with the United States. Speaking at annual economic forum 40 years after China began what is known as the “reform and opening up” of its economy, Xi pledged to begin a new phase of that process. The Trump administration has threatened to impose $150 billion in tariffs on Chinese imports over allegations of unfair trade practices. But his speech was more a reiteration of existing commitments than any major new initiatives, and experts said it was neither concrete enough in itself, nor far-reaching enough, to defuse the trade dispute with Washington — especially after years of broken promises. Addressing several of the concerns raised by the U.S. administration and business community, Xi promised significantly lower import tariffs for vehicles, an easing of restrictions on foreign investment in autos and financial services, and greater protection for intellectual property. Only a few hours before, President Donald Trump had tweeted about China’s unfair 25 percent tariffs on car imports. Speaking at the Boao Economic Forum on the southern Chinese island of Hainan, Xi pledged to “significantly broaden market access” for foreign companies, including a pledge to ease foreign equity restrictions in the automobile industry “as soon as possible” and “significantly lower import tariffs” for vehicles. Jake Parker at the U.S. China Business Council said Xi had addressed some key concerns, but had fallen short of offering “paradigm-shifting announcements” on ending the joint venture and licensing requirements that give China leverage to force technology transfer in return for market access. China made a similar promise to cut auto tariffs in November when Trump visited Beijing, and again at the World Economic Forum in Davos, Switzerland, in January. U.S. officials have reacted with skepticism until now, saying it was time for action, not empty promises. Nevertheless, the fact that Xi made the commitment in a keynote speech at an important event, billed as China’s version of Davos, gives the promise more weight. Alicia Garcia-Herrero, chief Asia Pacific economist at bankers Natixis in Hong Kong, said Xi’s pledges were not concrete, immediate or far-reaching enough to defuse the trade dispute. “I suspect this is not going to go down as well with our friends in Washington as some people are hoping,” he said. Balding said it remained challenging to find a way out of the mounting trade conflict that left Trump and Xi, “both men with very large egos,” looking and feeling that they had not backed down to the other. China has consistently promised to further open its markets since Xi took office, but has largely failed to follow through on those promises. It has also ignored years of entreaties from the U.S. administration and business community to level the playing field for foreign companies and resolve problems through dialogue and negotiation. While U.S. business leaders in China want to avoid a trade war, there is broad support for the idea that it is time to get tough with Beijing. Xi has made it clear that his vision for a “socialist market economy” is one where the Communist Party and state remain firmly in control, while protecting and subsidizing key industries. That approach, a fundamental bone of contention with Washington, is not about to change, experts said. Nevertheless financial markets were moderately encouraged. Only last week, global share prices had tumbled as Washington and Beijing traded threats to impose tens of billions of dollars of tariffs on each other’s imports, in what was beginning to look like a high-stakes poker game. On Tuesday, at least, the talk was of tariff cuts not hikes, and stocks took heart: Japan’s main Nikkei share index ended 0.5 percent higher, while share indexes in Hong Kong and Shanghai recorded gains of 1.7 and 1.4 percent, respectively. The auto sector is one that Trump has highlighted as a concern. “I wish to emphasize that with regards to all those initiatives of opening up that I have just announced we have every intention to translate them into reality sooner rather than later,” he said. “We want the outcomes of our opening up efforts to deliver benefits as soon as possible to all enterprises and people in China and around the world,” he added. Xi also reiterated a call for developed nations — in other words the United States — to ease restrictions on high-tech exports to China. That’s not about to happen, with Washington citing national security concerns that such technologies would find their way into China’s defense industry. 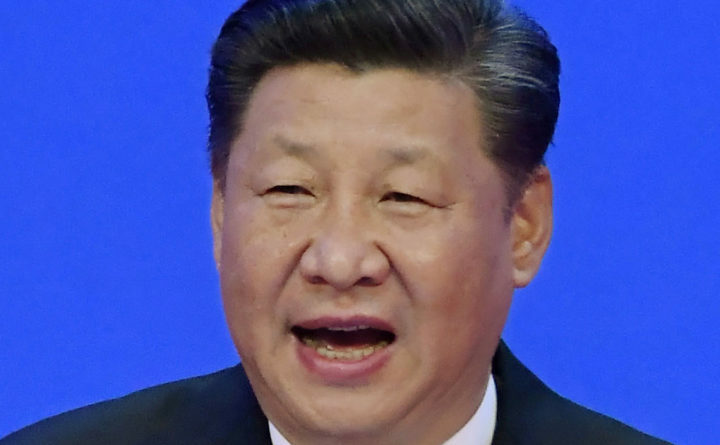 More generally, Xi tried to portray China as a defender of globalization and openness, just as he did at Davos last year, ignoring the fact that many sectors of China’s economy continue to restrict foreign trade and investment, and that he presides over the largest system of internet censorship in the world. “We live at a time with an overwhelming trend toward openness and connectivity, human history shows that openness leads to progress while seclusion leaves one behind,” Xi said, adding that the process of “reform and opening” of China’s economy had been the driving force for decades of progress, innovation and development in his country. “I wish to make it clear to you all that China’s door of opening up will not be closed and will only open even wider,” he said. While he made no direct mention of the trade war with the United States, he said a “zero-sum” and “Cold War” mentality look even more out of place than ever in the modern world. People’s Daily, the Communist Party mouthpiece, said China would never open its markets because of American pressure, but only for its own interests and at its own pace. On Tuesday, China officially filed its trade complaint against the United States with the World Trade Organization over the steel and aluminum tariffs. Washington Post writers Shirley Feng and Liu Yang contributed to this report.